In your fight against plaque and tooth decay, your toothbrush is your best friend. But this trusted ally will only be as effective as possible if you care for it well. Make caring for your toothbrush a regular part of your daily routine! An important part of caring for your toothbrush is cleaning it. After you brush, thoroughly rinse the bristles with water. If you drop the brush on the ground or feel that it is in any way contaminated, you can rinse it off with an alcohol-based mouthwash. Be careful not to skip rinsing your toothbrush. When you forget, toothpaste can dry on the bristles, making it harder to clear your teeth the next time you brush. Storage is also an important step for keeping your toothbrush in working order. You should store your toothbrush in an upright position to allow any extra water to drip off the bristles. If you keep your brush somewhere that the water can pool and sit on the bristles, bacteria may begin to grow. Bacteria doesn’t grow as well on a dry surface! Click this photo to see more helpful dental tips on our Instagram page! When does a toothbrush need to be replaced? The typical toothbrush is not meant to last a lifetime. Far from it, in fact. 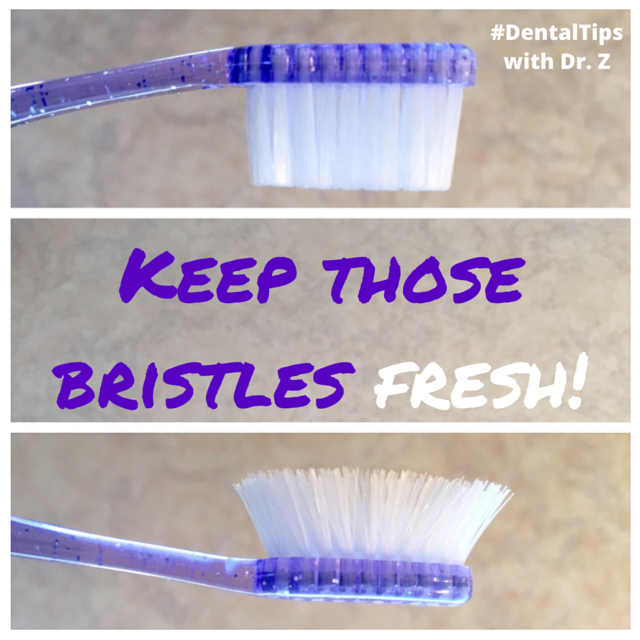 Even with proper care, the bristles eventually become bent out of shape from regular rubbing against your teeth and become less effective in removing plaque and food particles. A good rule of thumb is to replace your toothbrush every three months. If in doubt, check the bristles. If they’re bent or splayed outward, it’s time to buy a new brush. Some companies even make toothbrushes with colored bristles that fade over time. When the color is gone, you know it’s time for a replacement. The rule of replacing your toothbrush every three month clearly doesn’t apply to an electric toothbrush. You don’t need to buy several replacements each year. However, the three month rule of thumb does apply to the bristles. Most electric toothbrushes have heads that you can replace for a reasonable price when the bristles become worn out. Some brands, like Sonicare, even sell large packages of heads; enough to brush with for the whole year! You may have heard the rumor that storing your toothbrush near the toilet can expose it to bacteria caused by flushing the toilet. There was even an episode of Mythbusters dedicated to the subject! Well, there’s good news and bad news. The good news is that it doesn’t really matter where you keep your toothbrush. The bad news is that it will be exposed to some bacteria anywhere in the bathroom. But before you start storing your toothbrush in your bedroom, it’s important to note that the amount of bacteria that ends up on a toothbrush is very small, and scientists have determined that there is little harm that can result from using a toothbrush stored in the bathroom. Still concerned? If it makes you feel better, just rinse your toothbrush with an alcohol-based mouthwash before brushing. That should kill off any lingering bacteria.